I nearly choked on my lunch with laughter the other day after reading Alyson Kuhn's cleverly written post over at Felt & Wire about a recent home improvement project of long-time friend, Patrick Reagh who has lived and worked in Sebastopol, California as a letterpress printer for many long years. Last I heard from Patrick, he mentioned our friend Alyson was going to be writing something about his newly-remodeled shower. This puzzled me, but Patrick is always full of surprises and I knew it would be good. 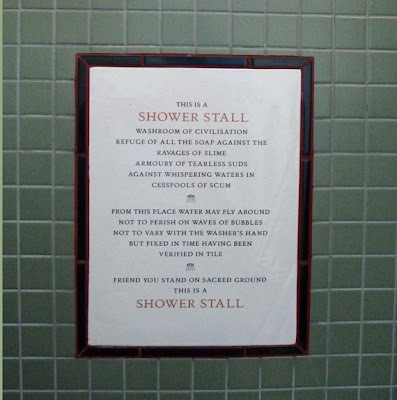 This time, he penned a wry parody of typographer Beatrice Warde's legendary manifesto, This is a Printing Office, and had it kiln-fired onto a tile for his new bathroom shower. 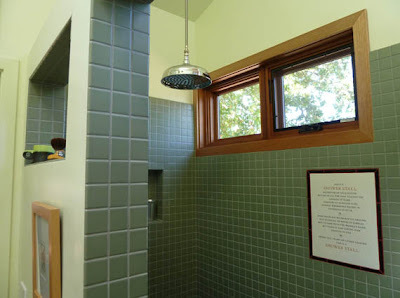 This is a Shower Stall, his soapy declaration about cesspools of scum, should now withstand the ravages of slime there on his shower wall for many years to come. 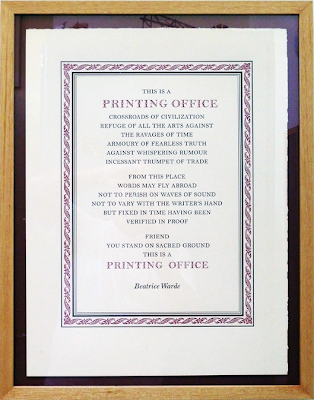 Above is a broadside of Warde's original text which Patrick letterpress printed in 2009. It hangs nearby in his bathroom, he claims, "as a reference for those who are unfamiliar with the text. You know, the unwashed masses. It is suitable for framing, and yes, there are a few available for sale should anyone be interested." 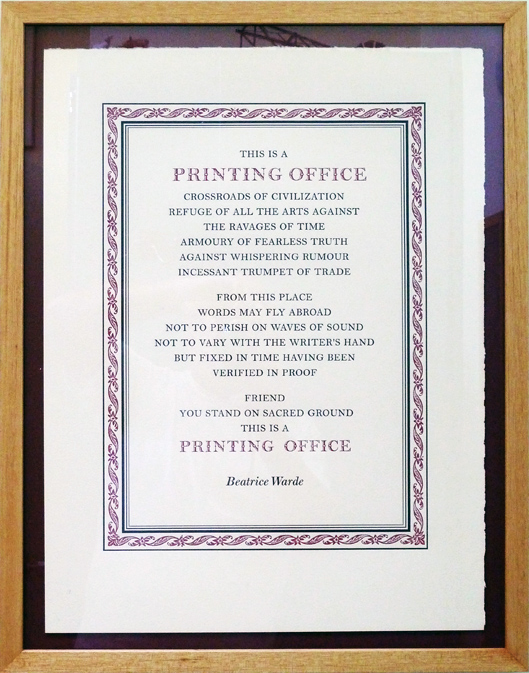 Beatrice Warde's original version of the broadside is found on the walls of countless printing shops and has been translated into many languages over the years. 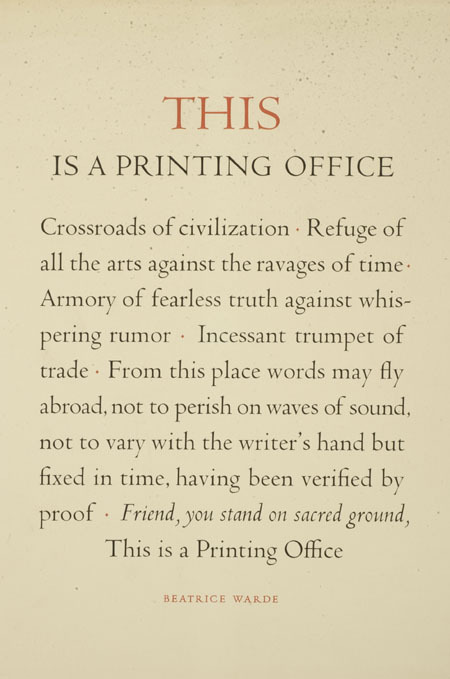 It has also been cast in bronze and mounted at the entrance to the U.S. Government Printing Office in Washington DC. 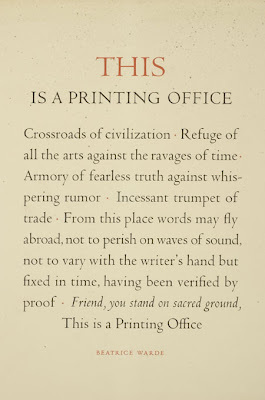 The version you see below was set in Centaur and Arrighi types and printed for the Type Directors Club of New York on the occasion of their dinner honoring Beatrice Warde in 1950. Just immediately below are Patrick's designs for his business cards with an uncanny likeness. I would expect nothing less of Patrick. They are perfect—portraits of a printer produced from printers' ornaments! You can find more past posts on P@ Reagh here and here, and check out Alyson Kuhn's featured post at Felt & Wire for more details and photos. Photos below © 2011 StudioAlex.